Twenty-plus years ago I was traveling with a bunch of friends in the southern Rhône Valley. We went to visit an art academy in a tributary valley called the Luberon ~ a district subsequently given a big dose of notoriety by Peter Mayle. We stayed in the little village of Gordes, a couple thousand feet above the valley floor with a magnificent view, and an even more magnificent restaurant called La Bastide. Surely, one of the top five meals of my life. None of us spoke much French, and the sommelier spoke very little English. Didn’t matter. We let him know we loved wine, and that we wanted to place ourselves in his hands for the evening. There were eight or nine of us. He must have brought fifteen dishes, each matched to a different wine. Took about five hours. All the wines were from the Rhône Valley, and half of them were white. Three or four of those were seven to fifteen years old. Each successive pairing was more stunning than the one before. There were bean dishes, followed by parsnip dishes, followed by mushroom dishes. I was transfixed. You had to be there. It was like a Quaker moment: so impressive, and yet so plain. Prominent among the grape varieties on display was Roussanne. I’d barely heard of it before. But the style was very attractive. It had the weight and length of good Chardonnay. By which I mean serious flavor and complexity in the mouth. It had the ability to age well in bottle. By which I mean the ability to develop enjoyable smells and flavors beyond those that could be found in the wine when it was young. And it had nuanced fruit and floral aromas to which no Chardonnay has ever laid claim. Finally, there was this utilitarian, root vegetable patina to the wine which spoke of noble yeomen, honest labor, and good health. Roussanne is often blended with other grapes: Marsanne in the northern Rhône; Grenache Blanc in the south. This trick is not to demean Roussanne wine quality, it is a relatively difficult grape to grow, subject to mildew in moist summers and not very productive. The blending grapes add some complexity, but mostly they are used because they are reliable producers, and there are lots of them planted. Assume what you may as to implications for the quality of white wines from the Rhône in the future. My advice: taste each vintage before you buy any quantity to cellar. In California it is much more common to see wines labeled as Roussanne. That means they are at least 75% Roussanne by regulation. The grape variety is fairly new to California, and its first importation at the end of the 1980’s was a bit of slapstick comedy. Today there are still only 350 acres of Roussanne in CA. Twelve of those acres are in Napa, where the grapes sell for over $7,000 per ton ~ 50% more than the average price for Napa Cabernet Sauvignon. Thirty-five acres of Roussanne grow in Monterey, where the price per ton is a still outrageous $3,765. That is four times what Monterey growers get for Cabernet, and almost four times what they get for Chardonnay. Rarity begats its own privileges. There are 130 acres of Roussanne combined in San Luis Obispo and Santa Barbara counties, where the grapes sell for half the price they do in Monterey. Go figure. I guess there aren’t enough transactions to really have a marketplace. Is it any wonder I chose Roussanne as my focus during last week’s Rhone Rangers Show at San Francisco’s Fort Mason? There were 500 to 600 wines on offer at Rhône Rangers. Twenty of them were Roussannes according to the catalog. Four of those producers failed to show up. Roussanne is still in an adolescent stage in CA. There is no standard against which to compare examples. Prices ranged from $15 per bottle to $35. Some of the wines were simply not well made. Nothing unusual there. Common problems were oxidation and overly acidulated, tasteless wines (perhaps unripe). A couple of the wines, from well-known producers, had extremely distinctive characteristics. The Qupé, for instance, had lots of toasty oak, overshadowing ghost-like flavor notes. The Terre Rouge was earthy, with a citrus rind nose, much in the genre of the ‘herb tea’ descriptor used by Jancis Robinson, and duplicated by several commentators who appear to have borrowed from the Oxford Companion to Wine. To me the Terre Rouge spoke of aging potential. The Tablas Creek was fruity in the nose, but nicely restrained at the same time. I was remarking to myself, while smelling it, how finely tuned it seemed. Then I put it in my mouth. Talk about shocking minerality! It was as if my glass had just deployed a steel pike. I’m not entirely sure where I come down on the minerality concept for Roussanne, but I know this one is working outside the box. I liked three of the wines more than the others: Stephan Vyds from Paso Robles; Truchard from Napa; and Holly’s Hill from El Dorado County. I think balance is extremely important in a Roussanne. Holly’s Hill (www.HollysHill.com) demonstrates that feature very neatly. It has both pear-like fruit aromatics and some shy florals, but they are all nicely cinched down. The flavors reminded me of one of those fragrant Japanese lemons: Yuzu or Sudachi. Not the juice; the marmalade made from the zest. Best of all the wine is priced at $18. The Stephan Vyds (www.aventurewine.com) is twice as expensive, and mildly simple by comparison. It does have that beguilingly fragrant tea leaf nose though, and lots of mouth-filling body. Truchard (www.truchardvineyards.com) has a bit of track-record, so I was surprised to note it priced at $22. It has that combination of pith and orange blossom in the nose, without being too loud or effusive. The profile is long, and the flavors are very complex, faceted. Real nice wine, at a price which in Napa is something of a gift. If there is a classic dish to pair with Roussanne, I’d vote for cassoulet. No question about the dish being a classic anyway. Personally, being a Californian, I’m more likely to have some Thai soup redolent of lemon grass and loaded with coconut milk. Those elements really have got Roussanne’s number. Put a little seafood in a tomato bisque. Add lots of vegetables. Light it up with some hot sauce. Put in the coconut milk, the lemon grass, and some turmeric. Light chill on the Roussanne. Not a first course; serve as a meal with crusty bread. 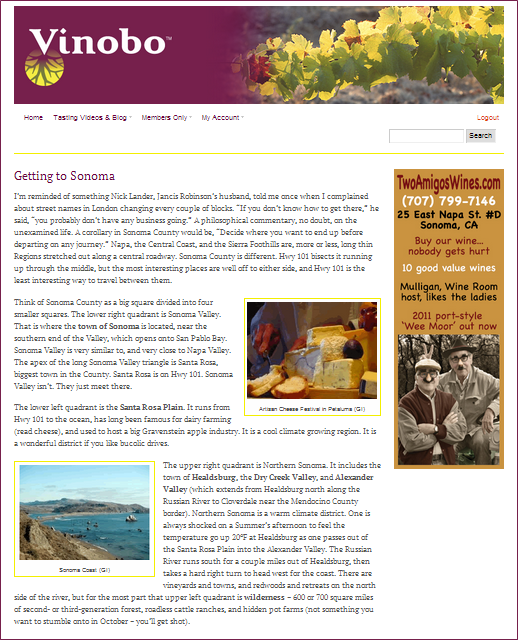 Previous Previous post: What is Bruce Cass Wine Tours?